When I opened my own podcast recording studio, my 8-year old daughter Michelle was the most excited of all. 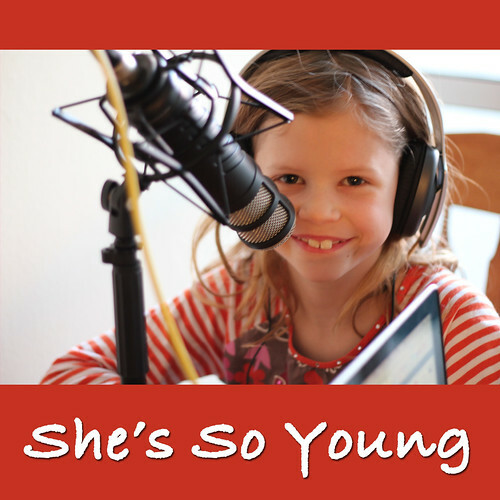 She wanted to know exactly how it works and now happily hosts her very own podcast she calls She's So Young. She's So Young is already two episodes deep and has its own iTunes channel. She's rather proud of this fact, so if you could subscribe and leave a positive comment, she'd love it. Before we record each episode, Michelle writes down the topics she wants to cover and by episode two was driving the content all by herself. Here's episode two of She's So Young. Sounds really good!! Once I get my itunes up and running, I'll be subscribing to this and T.O. Mike'd. Mike - You Gotta be proud. Great job Michelle. Great Job Michelle, looks like the ladies have set up a coup to oust you Mike. No wonder it sounded so good. A number of years ago there was a podcast called "Radio Free Calamity" that was done by a 14 year old girl and her 10 year old brother in Toronto. It was actually really good. Sadly they no longer do the podcast but you might be able to find past episodes of the podcast somewhere on the interwebs. Mike, I couldn't wait to listen to this one, it was excellent. I'll subscribe to the iTunes feed later tonight. Michelle, your podcast was interesting, well thought out and flowed nicely. Keep up the great work! I absolutely adored this podcast! Brilliant job, Michelle - you are a natural. I really love your voice - you're super smart, articulate and a pleasure to listen to. I enjoyed the topics and the way the three of you interacted. Already looking forward to hearing the next one. Outstanding job! I'm going to let my nieces know about your podcast - thank you for doing it. Liz said it Michelle you are a natural! thanks everyone i am so happy that you like my podcast and i hope you'll like my next one. That is really cool! You have such a smart and charming daughter. I am simply amazed that she is only eight years old but she can come up with entertaining stuff to talk about. I am checking out her podcast for sure.